Early on the second day of our road trip we had our first true Wadi (a valley or river that often only flows after heavy rains) experience at Wadi Shab. This valley in particular is one of the most popular with locals and tourists alike due to its beauty and incredible conditions for swimming. A 30 minute hike gives way to a sequence of highly swimmable, clear turquoise pools. Upon reaching the end, those willing to swim a bit further through a narrow passage in the rock are handsomely rewarded with a waterfall cave of otherworldly beauty. 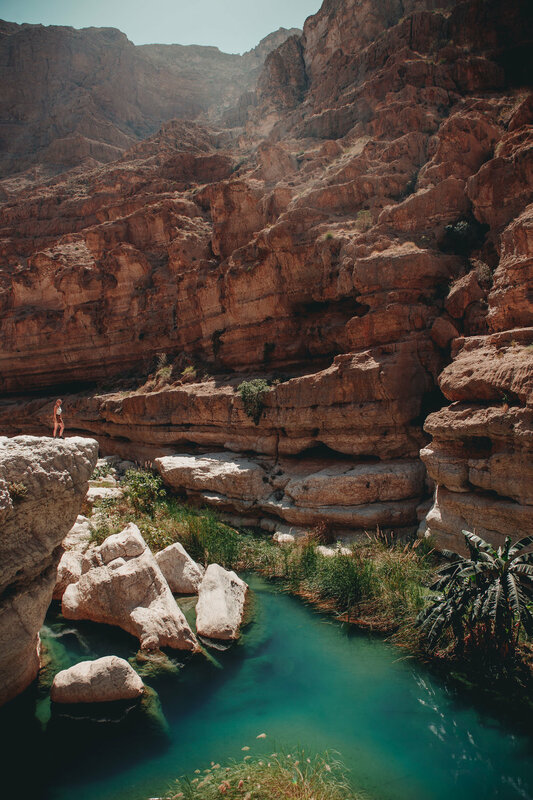 It was unlike anything we had ever seen and is certainly a must-do attraction in Oman. After a refreshing swim in Wadi Shab and some exciting off-roading around Wadi Tiwi, we made our way down the coast toward our second campsite near the town of Sur. The area is famous for a tradition of building a kind of boat called a Dhow, which stemmed from its strategic location for trade in ancient times. Although the construction of Dhows has slowed down in modern times, there is still a boat yard where they build these beautiful vessels according to tradition, and without advanced tools or even technical plans. Even more, the boat builders and yard masters welcome respectful tourists to come into the work area and check out the ongoing projects. After getting permission to look inside, we clambered up the makeshift scaffolding and got a peak into the gorgeous ribcage and inner-construction of an in-progress Dhow.